I have heard back from Accuweather: "Unfortunately, that product is no longer being support by our Digital Media team." So, for those frustrated by the failure of your weather docklet, I am afraid the answer is tough luck. Accuweather has closed avenues for Stardock's people to fix it, so don't ever expect one from Stardock or from Accuweather. Find something else instead, and good luck to you. For Firefox users, there is a nice little add-on called Firefoxcast. For other browsers, I don't know. Try HTC Home 3, it is a lot better than the ObjectDock one anyway. Thanks, LightStar, I did try it, but for some reason, the weather dock on it doesn't like European weather. Didn't work at all. Anyway, I DO like ObjectDock just fine - the thread was to inform folks that there is no use writing more threads on the weather docklet - support for it has been withdrawn from both sides, so there is nothing to be done. However, it is good if people offer alternatives to weather docklet here. I am not sure Stardock will appreciate though offering alternatives to ObjectDock here. 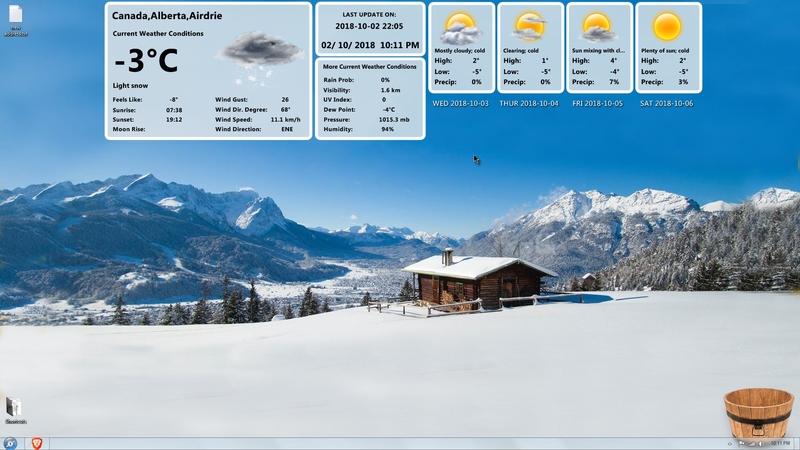 The weather dock in Winstep works providing your location is listed. Mine isn't so the closest one to me is the Philly airport. There's almost no difference. The built-in database of over 70,000+ cities worldwide is there only to help the user select his location (although the user's current location is normally automatically detected on first run based on GeoIP location, i.e. ; based on the IP address of the user). If your actual location is not part of the built-in database, all you need to do is go to Weather.com's site, get your location's Weather.com code from them and manually type that in (as well as the city name) into the respective fields of the Weather Settings dialog. This said, be aware that many neighbor locations share the same weather station data despite having different codes (i.e. ; multiple weather.com codes map to a single weather station in the same area). Also, the weather module in Winstep applications uses multiple redundant feeds (NOAA, Weather.com, Yahoo and MSN), so if one fails for any reason the others take over. ObjectDock is now gone on my desktop, replaced by WinStep Nexus! Great dock! Only wish it had more dock tiles. Only wish it had more dock tiles. What do you mean? More space to add items, or more themes? If the latter, Nexus is compatible with skins for all the other popular docks (ObjectDock, RocketDock, RKLauncher, Yz Dock, etc...). Well that sounds good JC! I will look into that. I only use tiles so I will see how to install them from ObjectDock tiles. Figured it out and it works great! is that something that will work in objectdock? because I am not interested in using different software for this. I can just put a shortcut in objectdock for Weather.com and be done with it. You don't have to use different software, I was just giving an example that the accuweather feed still works with other apps.